Summary: Sixteen-year-old Deirdre Monaghan is a prodigiously gifted musician. She's about to find out she's also a cloverhand - one who can see faeries. My Thoughts: I'll start off by saying Maggie is one of my favorite authors. I was sucked into Shiver and really enjoyed Linger. Lament was a whole new story with new characters. We meet Deirdre who is a very good musician. I got the vibe she wasn't very popular, just your normal average 16 year old girl. She kind of keeps to herself but does have a best friend named James. I really liked James but we didn't get to know him very well. He made appearances throughout the story but never for very long and never many details. We also meet Luke who is infatuated with Dee. They are drawn to one another which begins their epic love story. Luke was sent to kill Dee but he falls in love with her. That than upsets the queen and all heck breaks lose. I really enjoyed hearing Luke's story. I wasn't too sure about him at first. I wanted to know more about him and why he acted the way he did. 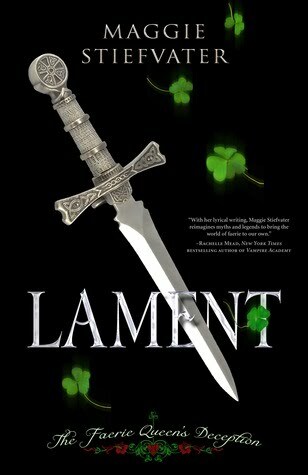 I enjoyed Lament but I didn't love it as much as Shiver. I just felt I couldn't connect to Dee and Luke as much as Grace and Sam. Luke was a likable character and he had some good moments but I wasn't hanging on his every word like I was on Sam's. I still will be reading Ballad soon. I find it hard I didn't like this book as much as Shiver though, I have been on a fairy kick lately so I thought I would have loved loved it. Overall: Really liked it but didn't love it. Ballad here I come. I want to know more about James. Cover: I like the cover but think I like the cover for Ballad more. I defintely want to read this book. Thanks for the review! I really liked Lament, but I LOVED Ballad. James...*swoon*. And I much prefered him as the protagonist over Diedre. She gets quite annoying in Ballad, so watch out. I want to read this book...sounds exciting!